Des Moines — The Iowa Barnstormers (5-0) needed all 60 minutes to put away the Cedar Rapids River Kings (1-5) and continue their undefeated season Saturday. Iowa won 59-48 in their second home game of the year at Wells Fargo Arena. The River Kings got the ball to open the game and only needed two plays to find the end zone. Quarterback Kurt Palandech hit receiver Drake White for a 27 yard touchdown pass. After a made extra point, the score was 7-0. The Barnstormers didn’t need long to answer back. Running back Jamal Tyler cut back and found a hole for a 39 yard touchdown run. Kicker Nathan Criswell made the PAT, 7-7. On the next possession for Cedar Rapids Palandech found White again. This time White went over the board for the touchdown grab, 14-7. Once again, Tyler was the one who answered back with his legs and found the end zone. The Barnstormers tied it up 14-14 before the quarter came to a close. Cedar Rapids attempted a field goal to start the second quarter, but it was no good. On the third offensive possession for the Barnstormers, Daquan Neal scored on a quarterback sneak. The PAT was no good and Iowa led, 20-14. Cedar Rapids running back Nathaniel Chavious bounced off a defender for a 17 yard touchdown run to tie things back up, 20-20. The Barnstormers scored again, this time when receiver Raheem Harvey got loose around the edge. After some personal fouls, the PAT was pushed back and resulted in a missed extra point, 26-20. Iowa defensive back Tevin Madison intercepted Palandech, but no points came out of it before halftime. A wild third quarter started when Neal was stripped on Iowa’s first offensive possession of the second half. The turnover led to a touchdown by the River Kings, 27-26. Neal made up for his mistake on the next possession, calling his own number on an eight yard touchdown run, 33-27. On the ensuing kickoff, Cedar Rapids receiver Marquel Wade took it 48 yards to the house. After a made extra point, the River Kings held a 34-33 advantage. River Kings defensive back Nick Brassell intercepted a ball thrown by Neal and Cedar Rapids again took advantage of the turnover. Chavious scored on a six yard touchdown run and Cedar Rapids held their largest lead of the night, 41-33. Before the third quarter was over, Neal hit receiver Jazeric Peterson on a deep route for a touchdown, 41-40. The Barnstormers defense held strong to start the fourth quarter, holding the River Kings to a missed field goal attempt. Iowa re-took the lead when Neal scrambled for a 32 yard touchdown run. After a failed two point conversion, Iowa led 46-41. Again, Cedar Rapids’ special teams came through. Wade scored on a kickoff return — his second of the night, and the River Kings took the lead back, 48-46. The lead was short-lived as Tyler earned his third touchdown run with 3:56 remaining. After another failed two point conversion, Iowa held a 52-48 lead. In possibly the biggest play of the night, the defense held strong, preventing a fourth down completion after head coach Dixie Wooten threw a challenge flag that reversed the call. Iowa got the ball back on offense and scored when Neal found receiver Ryan Balentine on fourth down to extend the lead to 58-48. 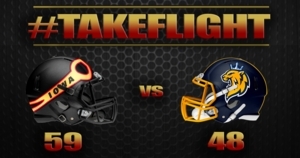 The Barnstormers’ kickoff unit forced a touchback, giving the squad one more point, 59-48. The Barnstormers travel to take on the Bismarck Bucks (0-5) this Sunday, April 14. Kickoff is set for 2:05 p.m. CST at the Bismarck Event Center.